Yesterday sometime around dusk where we stopped to spend the night on what turned out to be land administered by the National Park Service, two rangers appeared informing us we were illegally camping and we could not spend the night here. The Mules informed the rangers we were traveling across country and anybody doing so either by horseback, bicycle or foot has the right to stop and rest for the night on public space. We were not dragging in rugs, bedsprings, mattresses nor would be changing our oil or doing maintenance on our motorhome. Simply be here for the night, clean up after ourselves, be gone come morning. 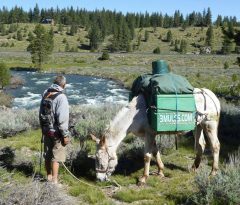 The ranger got on his communication device, talked to headquarters, a decision was made to let the Mules spend the night. The above event of yesterday is the National Park Service acknowledging and understanding the value and importance of a National Park Nomadic Lifestyle Pass. This Pass will be issued to all citizens who wish to travel throughout this country non-motorized either by horse, bicycle or foot. Showing in a real way, one step at a time, a human being living outside responsibly with respect and reverence for the Natural World. Certainly condusive to the mission and purpose of our National Parks.